If you’re looking to prepare for the next step in your virtualization career, VMware certification is a great way to set yourself apart – and ahead – of the competition. VMware certified professionals have demonstrated competence in the maintenance, administration, and deployment of the world’s most popular primary virtualization platform. Becoming VMware certified requires not only textbook knowledge of how virtualization systems are implemented and used, but also requires the ability to apply this knowledge to real-world scenarios across multiple hardware and software platforms. Certification exams cover various aspects of VMware administration and various platform types including data center and desktop deployment. When preparing for technology certification exams, professionals trust the experience of MeasureUp’s practice exams. 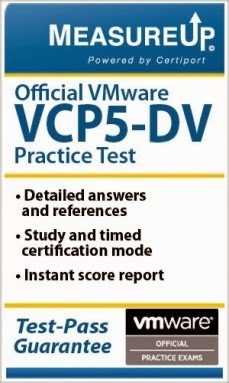 The Official VCP5 Practice Exam from MeasureUp, for the VCP5- DCV data center certification; combines MeasureUp’s experience in providing effective practice exams with VMware’s extensive virtualization knowledge and experience. This digital practice test includes real-world VCP test questions, with references and explanations, to ensure you fully understand the meaning behind the questions and answers. The practice exam can be taken as a timed exam, or in study mode,; offering you the flexibility to review questions in depth or take a practice run for the real exam. And, a test-pass guarantee ensures that you meet your goals – or receive your money back! This extensive VCP practice test covers all the topics of the VCP5-DCV certification exam incluiding vSphere Networking, vSphere storage, vApps; and troubleshooting vSphere and ESXi configurations. Instant score reports allow you to track your progress and make sure that you’re ready to take the next step. VMware Certification Marketplace offers a full line of VMware certification learning materials and practice tests, including the Official VCP5 Practice Exam from MeasureUp. Browse our selection today to begin preparing for the next step in your virtualization career. A really innovative and excellent idea of video lectures. A great attempt to cover all the topics with required deepness. I have just cleared the certification 2V0-731 questions answers, and the credit goes to the engaging videos.